I recently replaced a bathroom extractor fan. The new model uses "quick connect" electrical connectors, where I stick the house wiring into this little plastic device, and apparently that's all! The previous extractor fan used wire nuts in a metal-enclosed space similar to a junction box, but for this new model the wires just dangle out of the extractor fan module, and there's nothing in the instructions about a junction box. Leaving the wires dangling next to the insulation in the ceiling kinda freaks me out. Is that really what I'm supposed to do, or are the connections supposed to be enclosed in something? All connections must be in a junction box. They're mentioned several times in the instruction manual. Pull the wire through the hole and into the junction box (not included). 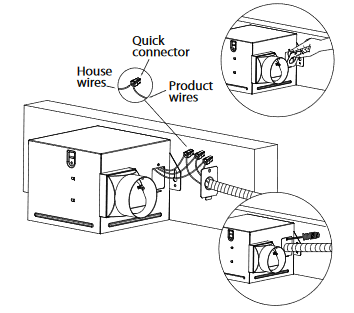 Using a quick connector, secure 120 VAC house wiring from the wall switch to the fan as shown in the wiring diagram on page 3. It is odd that this model doesn't provide an integrated box, but you're expected to provide one. Either that or we're all misled by poorly-written instructions and the connections should be made inside the fan housing as with every other fan ever made. Ever. Be sure to use a strain relief on the knockout (which is also usually included). 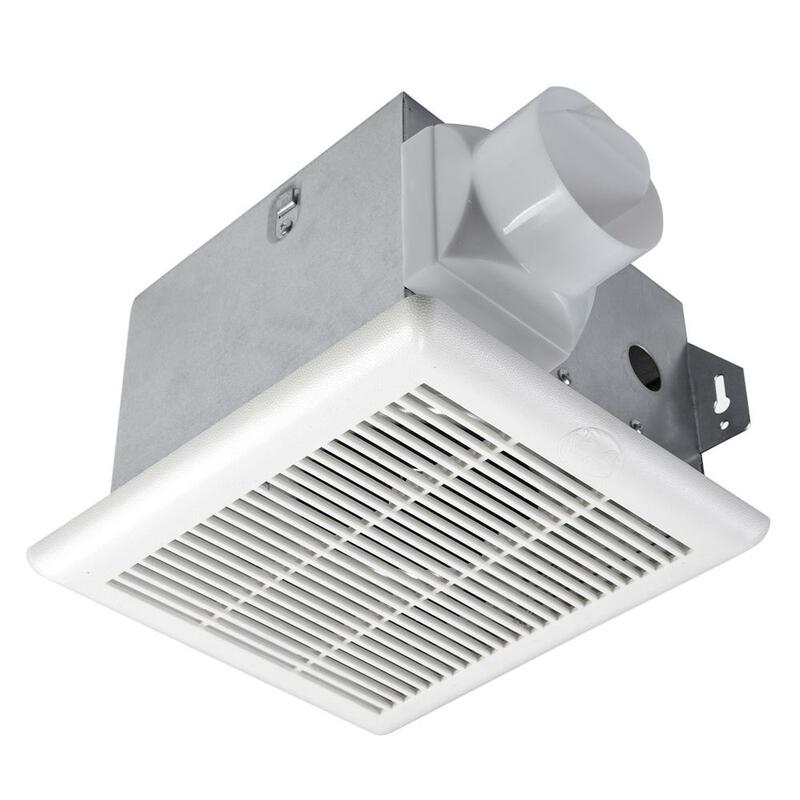 Having installed a Hampton Bay myself (Home Depot's in-house brand) I was surprised to hear it didn't have a built-in box (in fact, it would be stranger to find a bathroom exhaust fan that has no box at all). But the manual clearly shows this model DOES have a box. They show it (oddly enough) with armored cabled or conduit, but you can easily do this with NM wire and a NM clamp (you'll need to buy a clamp as they don't supply it). That should be a 1/2" knockout in that cover plate. You're right that the manual is not clear about the junction box. The fan housing itself either has a junction box, or counts as a junction box. If you're using armored cable, then you need to attach the appropriate fitting to the wiring hole on the housing. If you're using NMS cable, then you should use an appropriately sized wire clamp. ALL wiring connections, whether wire nutted, kerneyed, or push connectors, MUST be made within some kind of junction box. Most bathroom exhaust fans have an internal junction box specifically for this. Not the answer you're looking for? Browse other questions tagged electrical wiring code-compliance junction-box or ask your own question.